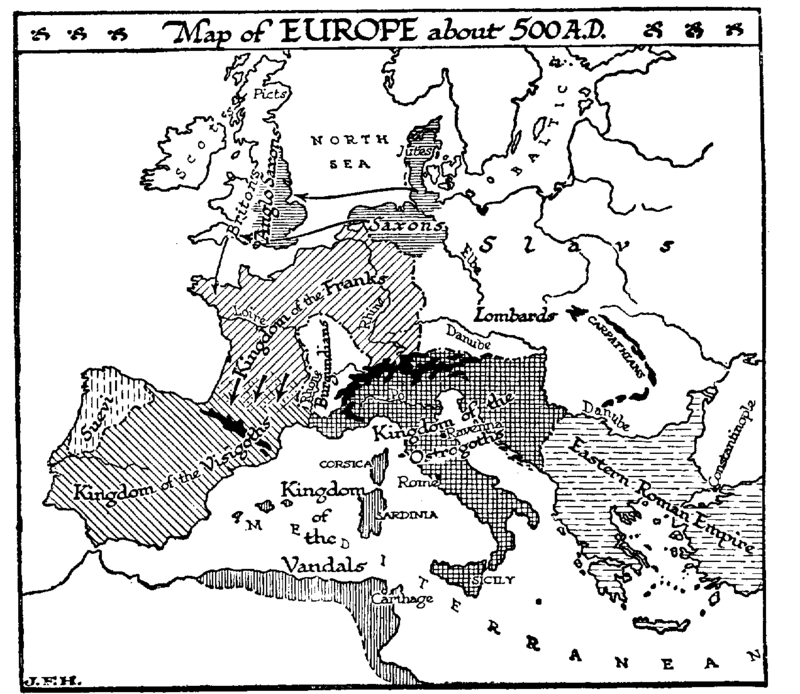 Figure 609: Map of Europe about 500 A.D. It is necessary that the reader should have a definite idea of the social condition of western Europe in the eighth century. It was not a barbarism. Eastern Europe was still barbaric and savage; things had progressed but little beyond the state of affairs described by Gibbon in his account of the mission of Priscus to Attila (see p. 485). But western Europe was a shattered civilization, without law, without administration, with roads destroyed and education disorganized, but still with great numbers of people with civilized ideas and habits and traditions. It was a time of confusion, of brigandage, of crimes unpunished and universal insecurity. It is very interesting to trace how, out of the universal mêlée the beginnings of a new order appeared. In a modern breakdown there would probably be the formation of local vigilance societies, which would combine and restore a police administration and a roughly democratic rule. But in the broken-down western empire of the sixth, seventh, and eighth centuries, men’s ideas turned rather to leaders than to committees, and the centres about which affairs crystallized were here barbaric chiefs, here a vigorous bishop or some surviving claimant to a Roman official position, here a long-recognized landowner or man of ancient family, and here again some vigorous usurper of power. No solitary man was safe. So men were forced to link themselves with others, preferably people stronger than themselves. The lonely man chose the most powerful and active person in his district and became his man. The freeman or the weak lordling of a petty territory linked himself to some more powerful lord. The protection of that lord (or the danger of his hostility) became more considerable with every such accession. So very rapidly there went on a process of political crystallization in the confused and lawless sea into which the Western Empire had liquefied. These natural associations and alliances of protector and subordinates grew very rapidly into a system, the feudal system, traces of which are still to be found in the social structure of every European community west of Russia. This process speedily took on technical forms and laws of its own. In such a country as Gaul it was already well in progress in the days of insecurity before the barbarian tribes broke into the empire as conquerors. The Franks when they came into Gaul brought with them an institution, which we have already noted in the case of the Macedonians, and which was probably of very wide distribution among the Nordic people, the gathering about the chief or war king of a body of young men of good family, the companions or comitatus, his counts or captains. It was natural in the case of invading peoples that the relations of a weak lord to a strong lord should take on the relations of a count to his king, and that a conquering chief should divide seized and confiscated estates among his companions. From the side of the decaying empire there came to feudalism the idea of the grouping for mutual protection of men and estates; from the Teutonic side came the notions of knightly association, devotion, and personal service. The former was the economic side of the institution, the latter the chivalrous. The analogy of the aggregation of feudal groupings with crystallization is a very close one. As the historian watches the whirling and eddying confusion of the fourth and fifth centuries in Western Europe, he begins to perceive the appearance of these pyramidal growths of heads and subordinates and sub-subordinates, which jostle against one another, branch, dissolve again, or coalesce. «We use the term ‘feudal system’ for convenience sake, but with a degree of impropriety if it conveys the meaning ‘systematic.’ Feudalism in its most flourishing age was anything but systematic. It was confusion roughly organized. Great diversity prevailed everywhere, and we should not be surprised to find some different fact or custom in every lordship. Anglo-Norman feudalism attained in the eleventh and twelfth centuries a logical completeness and a uniformity of practice which, in the feudal age proper, can hardly be found elsewhere through so large a territory… . «The foundation of the feudal relationship proper was the fief, which was usually land, but might be any desirable thing, as an office, a revenue in money or kind, the right to collect a toll, or operate a mill. In return for the fief, the man became the vassal of his lord; he knelt before him, and, with his hands between his lord’s hands, promised him fealty and service… . The faithful performance of all the duties he had assumed in homage constituted the vassal’s right and title to his fief. So long as they were fulfilled, he, and his heir after him, held the fief as his property, practically and in relation to all undertenants as if he were the owner. In the ceremony of homage and investiture, which is the creative contract of feudalism, the obligations assumed by the two parties were, as a rule, not specified in exact terms. They were determined by local custom… . In many points of detail the vassal’s services differed widely in different parts of the feudal world. We may say, however, that they fall into two classes, general and specific. The general included all that might come under the idea of loyalty, seeking the lord’s interests, keeping his secrets, betraying the plans of his enemies, protecting his family, etc. The specific services are capable of more definite statement, and they usually received exact definition in custom and sometimes in written documents. The most characteristic of these was the military service, which included appearance, in the field on summons with a certain force, often armed in a specified way, and remaining a specified length of time. It often included also the duty of guarding the lord’s castle, and of holding one’s own castle subject to the plans of the lord for the defence of his fief… . But this was the theory that was superimposed upon the established facts. The reality of feudalism was its voluntary co-operation. «The feudal state was one in which, it has been said, private law had usurped the place of public law». But rather is it truer that public law had failed and vanished and private law had come in to fill the vacuum. Public duty had become private obligation. Encyclopaedia Britannica, article “Feudalism,” by Professor G. B. Adams.